There is a lot of debate these days if copyright laws are still useful or have become useless. I can tell you right up that people who make a living from their work will always find it useful, whereas the users of those created pieces might argue there shouldn’t be any restrictions. You as an artist in particular have to understand that copyright encourages the progress of creativity and enables artisans to make a living through their work. The intent of copyright law is to not only to encourage creativity but to protect creators with an exclusive control over their hard work and personal creativity. recorded in “material form” (that is, in a form from which they could be reproduced: for example, by making a craft item, painting a picture, taking a photograph or making an artwork in digital form). craftworks (such as mosaics, tapestries, jewellery and woven art). He reluctantly refused to adhere to such law and replied that it would not matter if he would sell it because no one would know. I then explained to him the importance of copyright is for the protection of artists like himself and myself. He rejected the reason for such law as to him the thought of making a profit was more significant than the fact of breaching a law. When I unfolded he could be sued when transgressing the law; he argued that he is too young to be convicted of a crime. Well, the whole affair went into a wonderfully healthy discussion of moral matters and as to why the breaking of a law, even if one disagrees with such rule and despite that, no one may ever found out, is still wrong. 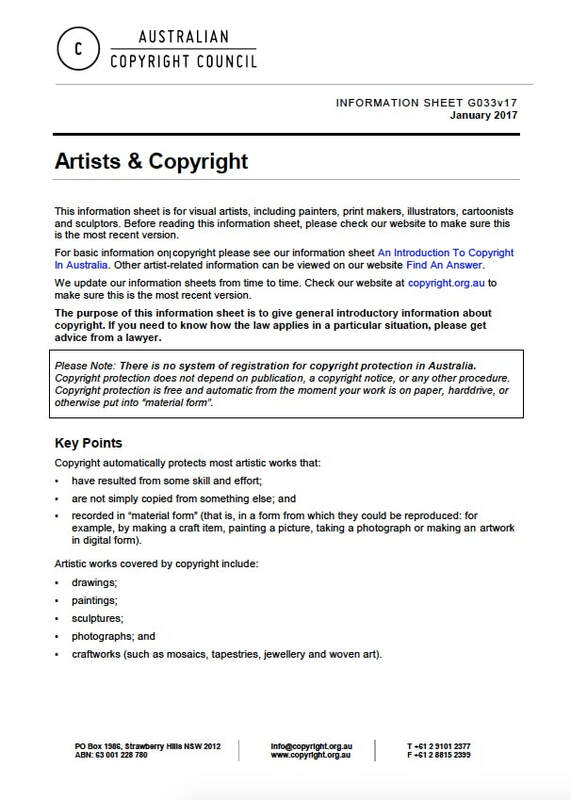 Copyright today is not only overlooked but also profoundly misunderstood. The amount of times I hear people say that copying is allowed as long as one uses just up to 25% of someone's work is somewhat frightening, and I wonder how such myth persists to date when the law protects an artist 100% and every part of his creations. This law was corrected aeons ago. The moment you put your pencil or brush into action, any mark you create and put down on paper is copyrighted. Puncto! You do not need to claim or register it, as it is literally self-activated. There is no “if” or “but” or anything else. An artist doesn’t copy another artists work out of respect to one another. An artwork is and becomes valuable because it is a “one-off”, it is unique, and the time that has been spent by some creative to get there must be valued. If we steal an image from another artist, be it a photographer or fine artist, we acknowledge that it has value, something we like, but at the same time, we refuse to give credit to its creator. To learn to produce unique works can take years, in skill and creativity. By the way, we can learn creativity, as it is a matter of stretching the brain on a regular basis which then widens connections within the brain and can call up ideas faster and from almost unrelated corners of the mind. Professional skills accumulate through persistent drawing and painting in practice. To copy someone else's work is a shortcut, a lazy way to get to exceptional results earlier by stealing. On a moral basis, it is interesting how quickly we justify a crime, yes crime, no matter how small, if we believe it doesn’t present too much harm to someone or everyone else is doing it. The movie (Dis) Honesty: The Truth About Lies examines how falsehood sprouts amongst us. In one of their research studies, people had to attend a test situation in which they had to answer several hard questions and were given five minutes to answer as many questions as they could. Told that the results they had written down would go into the shredder and nobody would check the results, and with a promise of being paid $100 per correct answer, many stumbled. Concealed to participants that only the first cover page went into the shredder, the results remained available for researchers to record false answers. The outcome, of 40,000 people (a vast research number), a bulking 70% lied in the experiment. Twenty per cent were heavy tricksters, and 50% cheated only a little bit. They conducted several tests to demonstrate how easy we give into cheating if we can rationalise that it would not hurt that much, that we are doing something for other people, or that everyone else is doing it too. These types of rationalisations work supersonic in our kind. The intriguing aspect of the experiment draws breath from the fact that the most significant harm related actually to minor frauds, which had a combined cheating loss of tens of thousands of dollars. Partakers believed that their fabricated lie was only a small one and would not hurt anyone sizeably. The greatest injury to our economy is by people from all walks of life who honestly believe that it is Ok to cheat as long as it in small doses. But our cries are heard when we are the ones been cheated. Somewhere along the line, it is lost in translation, that our life is by no means in any way significantly better because of those small items we steal from others, while it can be part of such great damage and should bypass, plainly because it is wrong. Follow-up research with the same content but a slight twist was to give people tokens instead of cash first, which then had to be exchanged into money at another table only a couple of meters away. The result, the cheating doubled! That was probably the most troubling outcome of all tests, as our society is moving fast to plastic cards and chips instead of real money.